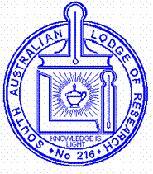 The South Australian Lodge of Research (1965–2013) was a foundation member of the Australian Masonic Research Council. In its early days it exchanged loose-leaf research papers with Canberra Lodge of Research and Instruction. In its later years it published its Transactions in book form, then ceased publication. This work is out of print and difficult to access, so Linford will provide a digital home for it—the book-form Transactions now, and the other material when digitised.